I like it! Adds such a bright spot of color. That's just wierd but beautiful. 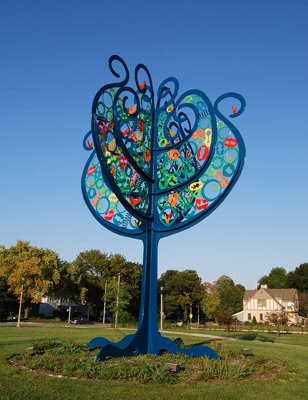 This tree sculpture is titled "Tree of Life" and it was created by artist Nancy Metz White in 2002. She also created "Magic Grove" in another Milwaukee park. The leaves are, indeed, recycled. They are made out of flash forgings from Milwaukee industry. The pieces being manufactured were extracted from the center, leaving the excess metal as scrap, which was recovered and reclaimed by the artist.